Our next generation of TruePower Plus Inverters are available in both Modified Sine Wave (MS) and Pure Sine Wave (PS) models. 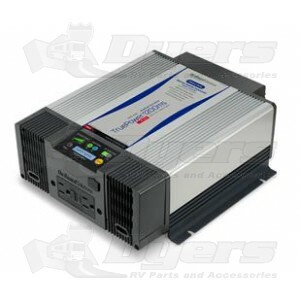 Designed to convert 12 Volt DC battery power to 115 Volt AC and automatically pass through AC Inlet power when present. Rich with features such as Innovative dual color digital LCD message center, dual color gauges for AC power output and battery DC input, USB power port, GFCI convenience outlets, DC cable covers, and separate on/off remote. Integrated AC cable strain reliefs and front screw connection terminal blocks allow for quick and easy installation without the need for ring terminals for AC power connections. Designed with soft start noise filtered technology and x2 surge capability for powering demanding loads. Shock resistant construction with internal conformal coated electronics for protection in harsh environments.